A late Gift Set, issued in 1973 and staying around until 1978. Although this period saw some dreadful models, this is one of the really nice ones. 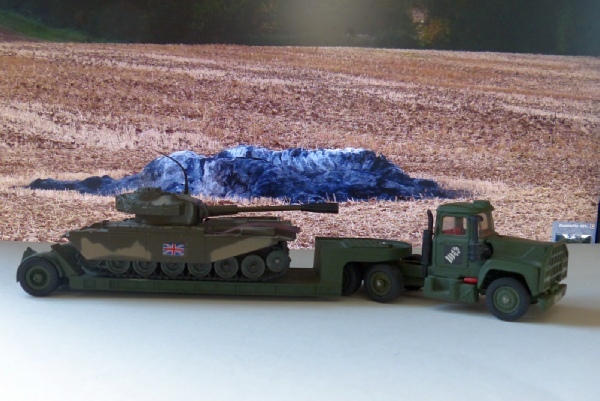 The Mack truck unit pulls a machinery carrier that you may recognise. It is essentially identical to 1104, 1131 and 1135, with even the same removable rear axle. A slightly odd-looking screw joins the two and there is now no winch or spare tyre capstan but otherwise it’s the same item. The red lever on the side of the cab operates the engine cover. The engine is painted the same khaki as the rest of the vehicle which is the one sign of cost savings here. I suppose the other sign would be the tank. It is made in Hong Long! That’s quite a surprise as the transporter is clearly British made. The tank is really heavy, with rotating and lifting gun, aerial intact and complete cables around the front. The Union Jack transfers are all good too. My dad would approve of the ‘mailed fist’ logo on the doors and rear axle as that was the badge he wore on his blazer, being the unit he fought in in the Second World War. He probably even drove one of these things. This example looks basically unused - not a mark anywhere. Lovely.